The article posted below reveals the latest archaelogical conclusion that Stonehenge was considered a place of healing by pre-historic tribes. There seems to be a reasonable amount of physical evidence to back up this conclusion, i.e. chips of the blue stones interred among the dead as well as a considerable amount of damaged and/or diseased corpses buried in the area. The tradition of bringing the ill and injured to the stone monument in hopes of miraculous healing seems to be one that continued at least until Medeival times. This conclusion is far from surprising, considering the reverence monoliths like Stonehenge and others on the Salisbury Plain have evoked for centuries. The article makes a point that healing was not Stonehenge’s sole purpose, meaning that other functions that have been proposed–observatory, temple, sacred festival grounds, alien landing base–are still on the table. So perhaps archaeologists have added one more piece to the “why” puzzle… but they still have not plausibly addressed the “how.” If, as the article suggests, the stones used in the monument were “shipped by raft [over land?–ed.] or hand” from their Welsh quarries miles away to the plain, this is no minor feat. Neither is surgery, which apparently archaelogists have uncovered evidence of in this supposedly primitive culture. The skills for huge construction projects and surgery may have been borrowed from other presumably more advanced cultures, such as Sumer, Phoenicia and Egypt where similar evidence exists. But where did THOSE cultures learn such advances? Back to more questions, aren’t we? And even if our pre-historic Celtic tribes did borrow the knowledge, thereby enriching their own cultures, modern historians would do well to cease categorizing Iron Age peoples as “primitive” simply because they had no written language. Their physical acheivements speak for themselves; and their spiritual & mystical heritage was so powerful that the invading Catholic Church built their own spiritual centers upon the very sites revered by the ancients, giving tacit acknowledgement of the power centers. We probably will never be able to definitively say how or why Stonehenge was constructed, and should be wary of trying to wrap up this mystery in a neat little mainstream package. For there may be much more here than our parochial modern minds can comprehend. 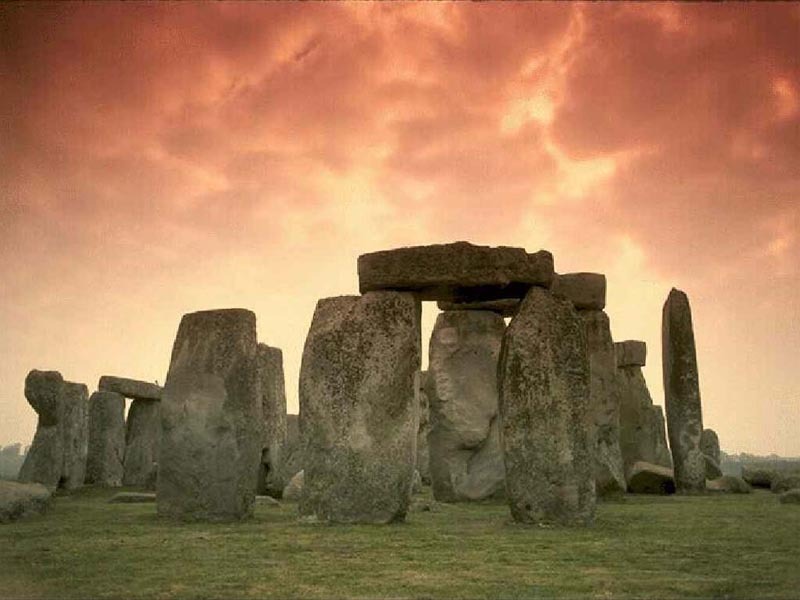 September 22, 2008 LONDON – The first excavation of Stonehenge in more than 40 years has uncovered evidence that the stone circle drew ailing pilgrims from around Europe for what they believed to be its healing properties, according to new research by archaeologists. Archaeologists Geoffrey Wainwright and Timothy Darvill said Monday that the content of graves scattered around the monument and the ancient chipping of its rocks to produce amulets indicated that Stonehenge was the primeval equivalent of Lourdes, the French shrine venerated for its supposed ability to cure the sick. “Even today, that’s the pretty serious end of medicine,” he said. Also found near Stonehenge was the body of a man known as the Amesbury Archer, who had a damaged skull and badly hurt knee and died around the time the stones were being installed. Analysis of the Archer’s bones showed he was from the Alps. The archaeologists managed to date the construction of the stone monument to about 2,300 B.C., a couple of centuries younger than was previously thought. It was at that time that bluestones – a rare rock known to geologists as spotted dolomite – were shipped by hand or by raft from Pembrokeshire in Wales to Salisbury Plain in southern England, to create the inner circle of Stonehenge. The outer circle, composed of much larger sandstone slabs, is what most people associate with the monument today, particularly since only about a third of the 80 or so bluestones remain. The scientists argued that they were once at the heart of Stonehenge, and closely associated with its healing properties. As evidence, Darvill said his dig had uncovered masses of fragments carved out of the bluestones by people to create amulets. Any rock carried around in such a way would have had some sort of protective or healing property, he said. He said that theory was backed by burials in southwest England where the stones were interred with their owners. Today the bluestones are now largely invisible, dwarfed by the huge sandstone monoliths – or “hanging stones” – that were erected later and still make up Stonehenge’s iconic profile. “I don’t think we can rule out the other main competing theory – that the temple was a meeting point between the land of the living and the dead,” he told the British Broadcasting Corp.
~ by Jolene Rae Harrington on September 22, 2008.
i needed this information so much for my oratory report! All the proofs of what Stonehenge was are on my website Stonehengeology.com and in my books and booklets. Example: 1/ Stonehenge has 56 Aubrey Holes and Mike Pitts quite rightly claims this number to represent the moon. 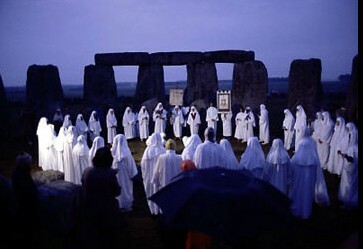 2/ Professor Alexander Thom called Woodhenge an EGG, but not publicly. 3/ Archaeologists continue to lie about Woodhenge by claiming it to be aligned on the sun when a 2008 GPS survey proved it to be aligned on the moon. 4/ Seahenge had 56 above-ground post-positions to represent the moon, yet archaeologists started counted them from the number 10 to fool us into believing there were only 55. So Seahenge and Woodhenge were both moon-eggs, and both are/were penetrated right through by solstice sunlight. John Wood, surveyor and architect claimed Stonehenge to be dedicated to the moon when he surveyed the monument in the year 1720. This too has been conveniently forgotten by lying archaeologists.